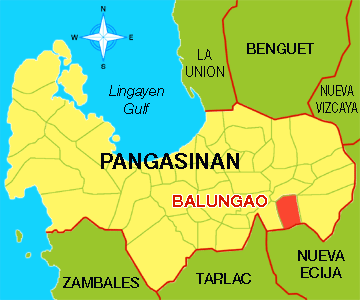 Balungao is one of the eastern municipalities of Pangasinan Province which is situated approximately 120 40′ to 120 44′ 30″ east longitude and 15 47′ to 15 50′ north latitude. The municipality is bounded by the municipality of Sta. Maria on the north, by the municipality of Cuyapo, Nueva Ecija on the south, by the municipality of Umingan on the east, and on the western side by the municipality of Rosales. The municipality is about 10 kilometers east of the Manila-North Road reckoning from Carmen, Rosales and about 25 kilometers southeast of Urdaneta. It is approximately 91 kilometers away from San Fernando, La Union, the regional center; 50 kilometers away from Dagupan City; 65 kilometers away from Lingayen, the provincial capital; 72 kilometers away from Baguio City, the country’s Summer Capital; and approximately 286 kilometers from Metro Manila, the country’s capital. The municipality is accessible by land. The chief means of public transportation in the area are public utility jeepneys and tricycles. The municipality has a total land area coverage of 9,380 hectares comprising 1.75 percent of the total land area of Pangasinan. Poblacion which is considered as the only urban barangay by NSO has an approximate land area of300.16 hectares equivalent to 3.20 percent of the municipal area. The remaining 9,079.84 hectares comprises the rural area. consisting of 19 barangays. The municipality is relatively uneven in physical features. The relief ranges from level to mountainous. The undulating to low volcanic hills are found in the barangays of Esmeralda, Mabini, and San Andres. The other barangays are level to nearly level. Its highest portion is found in Mt. Balungao with an elevation of 382 meters above sea level. It also the said area has the steepest slope of 30 to 50 percent. Surface run-off water drains towards major creeks which are subsidiaries of the Agno River. These creeks which traverse the different areas of the municipality usually swell up to three times their sizes during the rainy season, and are valuable means of irrigation sources. Owing to its good soils, Balungao has a good vegetative cover such as palay, vegetables, rootcrops and fruit trees. Balungao falls under the First Type of climate in the country characterized by two prominent seasons; the wet and dry season. Wet season occurs during the months of May to October while dry season lasts from the November to April. In 1989 to 1993, the municipality had a relative humidity of 80.87 percent per month in the minimum. In 1993, August was registered as having the highest relative humidity with 90 percent while the month of March registered the lowest. Balungao is shielded from the northeasterly winds by the Mountain Ranges forming part of the Cordillera Mountain. However, it is vulnerable to typhoons or cyclones because it is exposed to the southwest monsoon. Wind prevailing force in the town is put at 002 to 004 minute per second. There are five soil types found in Balungao, namely: San Fabian Series, Bantog Series, Guingua Series, San Manuel Series, and the Annam Complex. One or a combination of the said soil types can be found in a barangay, as observed in a survey conducted in the twenty barangays. San Manuel Series present in the municipality is the Silt Loam Type with grayish brown to pale brown surface and brownish gray to light brown with streaks of yellowish brown subsoil. The substratum of this soil type is yellowish brown to light reddish brown, friable and fine sand to medium sand. This type is suited to lowland rice, sugarcane, corn, rootcrops, vegetables, and some fruit trees. It can be cultivated safely and extensively to crops with ordinary good farming practices. It has the most widely adaptable uses and can be farmed easily, well-drained and not subject to frequent overflows. A Clay Loam Type or San Fabian soil series covers barangays Kita- Kita, Poblacion, Pugaro, San Aurelio, Angayan Sur, Esmeralda and San Andres. This type of soil has surface soil of dark brown to dark gray, has gravels and its subsoil is grayish brown. Its substratum is light gray to yellowish gray and fine textured. Rice, corn, camote, bananas, vegetables and some fruit trees are suitable for this type of soil. It is moderately good land and can be used regularly for crop cultivation in good rotation but needs intensive care conservation treatments. The Bantog Soil Series present in the town has a surface of brown, finely textured and slightly sticky clay loam. The subsoil is dark brown, heavy clay loam to clay. The substratum is light brown to light reddish brown clay and sticky without concretions. The principal crop in this type of soil is rice. This can be cultivated safely using easily applied conservation practices. The land is flat and the main problem is drainage because of poor soil permeability or shallow water table, which, therefore, requires simple drainage. It is also subject to occasional overflow resulting to occasional damage of crops. The Guingua Series in the municipality has a surface soil of brown, reddish or light brown friable and loose structure silt loam to fine sandy with reddish brown streaks. The subsoil is dark brown; light brown to light reddish brown, loose and friable to slightly compact silty clay loam. Crops like corn, sugarcane, camote, mango, and vegetables can be cultivated in this soil type. This can be cultivated safely and with ordinary farming practices. It has the most widely adaptable uses and can be farmed easily. It is level to nearly level land with deep, productive, easily worked soils, well drained and not subject to frequent damaging overflows. The Annam Complex soil type is generally described as: surface soil is grayish brown to pale brown, loose friable silt loam; subsoil is brownish gray to light with streaks of yellowish brown, friable granular silt loam. Low land rice, sugarcane, corn, rootcrops, vegetables and some fruits are suited for this type. This can also be cultivated safely and extensively to crops with ordinary farming practices and produces high yield as it is well drained and not subject to frequent floodings. Of the total land area of Balungao, 1,041.865 hectares is classified as forest and the rest is alienable and disposable. Of the forest area, 761.52 hectares or 73.09 percent is public forest and 280.345 hectares or 26.91 percent is unclassified public forest. In the area, a small parcel of Mt. Balungao, approximately 1,041.865 hectares or about 11.11% of the total land area of Balungao was released by the Bureau of Forest Development as forest reservation. Nonetheless, contrary to what is expected of a forest, only boho and bamboos and some undergrowth cover the specified area. Of the total 1041.865 hectares, only 761.52 hectares is the actually classified forest reservation, distributed as follows: 50 hectares for reforestation projects; 133.78 cogonal land; and 577.54 hectares for integrated social forestry projects. The municipality is blessed with non-metallic mineral in the form of red clay, which is used for making pots, bricks and other products. The volume of said mineral is not yet determined. The mineral is found in Barangay Kita-Kita and Poblacion. In the Municipality, surface waters are strategically located to be tapped for purposes of irrigation. The Banila River traversing barangays Capulaan, San Aurelio 3rd, Angayan Norte, Rajal and San Leon. Matablang River flowing along Mauban, Rajal, and Esmeralda. The Andulan creek along San Marcelino and San Julian. Pilo creek along San Raymundo and Angayan Norte. Borobor creek in San Miguel; Totonoguen creek along Capulaan, San Miguel and San Raymundo; Cabalancian creek along Poblacion and Kita-Kita; Manamikdak creek along Pugaro, San Aurelio 1 st, San Aurelio 2nd, Maasin creek still along San Aurelio 1 st, San Aurelio 2nd, Pugaro, San Marcelino, San Julian & Capulaan; Catil-Iaongan creek in Kita-Kita and the Ambuetel creek & Lagasit river flowing along the vicinity of San Joaquin. These bodies ofwater could be utilized in irrigating crop farms but the foreseen problem is the absence of motorized device with complete accessories to channel water from the source to the crop farms. Distance wise, and as to sufficiency of water, these sources would not be enough for irrigation purposes especially in the absence of rainfall where drying up is to be anticipated. Nonetheless, as was surveyed, there were for barangays spotted to be potential irrigable locations. The presence of shallow tube wells installed in barangays San Marcelino, San Julian, San Raymundo, and Capulaan, at least 50 hectares each barangay would be irrigated which could be planted to rice and corn.